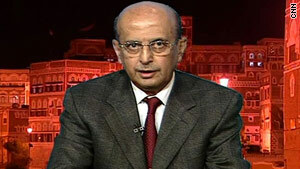 Yemeni Foreign Minister Abu Bakr al-Qirbi estimates their are 200-300 al Qaeda members in Yemen. (CNN) -- Periodic revolts. Dwindling natural resources. Large, ungoverned spaces welcoming to jihadists plotting strikes on Western targets locally and abroad. Welcome to Yemen, America -- watch your step. That's the advice analysts familiar with the region are offering as U.S. officials ponder what to do about the foothold the al Qaeda terrorist network appears to have gained at the heel of the Arabian Peninsula. The government of President Ali Abdullah Saleh has little control of its territory beyond the cities, said Pat Lang, a former Defense Intelligence Agency official who served as the U.S. military attache in what was then North Yemen in the 1980s. He said Saleh's government is one of many factions, tribal and sectarian, who fight "all kinds of little wars" against each other, with the government being "the only one that has jet aircraft." "Even the Arabs across the Arab world consider Yemen to be a strange, medieval place," Lang said. The government is fighting a 4-month-old battle against a Shiite Muslim uprising in its northwest and faces increasing pressure from a separatist movement in its south. Yemeni Foreign Minister Abu Bakr al-Qirbi acknowledged Wednesday that those insurgencies gave al Qaeda space to gain ground within its borders. "We have to confront all three challenges," al-Qirbi told CNN's "Amanpour" show. Al-Qirbi estimated the strength of the Yemen-based branch of al Qaeda at between 200 and 300 fighters. The group claimed responsibility for the Christmas Day bomb plot that targeted a U.S. jetliner, and the suspected perpetrator of that unsuccessful attack has said he was trained there. That has fueled calls for stepped-up U.S. efforts against the terror network in Yemen from American policymakers, and increased support for Saleh's government. Saleh, meanwhile, has had to walk a "fine line" between cooperating with U.S. counterterrorism efforts "and not being seen as in the pocket of the United States," said Richard Fontaine, an analyst at the Washington-based Center for a New American Security. Two years after the attack on the Cole, which killed 17 American sailors, Washington publicly admitted it was behind an attack on a group of al Qaeda operatives in Yemen that killed one of the suspected plotters of the Cole attack. The U.S. attack on Yemeni territory put Saleh's government "under a lot of domestic pressure" that hindered its efforts to target al Qaeda operatives on Yemeni territory, Fontaine said. In a statement claiming responsibility for the Christmas Day plot, al Qaeda in the Arabian Peninsula said the unsuccessful bombing was in retaliation for U.S. cruise missile strikes on its camps. U.S. officials, speaking on condition of anonymity, have acknowledged providing intelligence on al Qaeda targets to Yemeni authorities, but won't say whether U.S. aircraft or ordnance played any role in the strikes. Al-Qirbi said Wednesday that Yemen would not accept direct U.S. intervention. "We've always stated that we welcome any support from our partners in combating terrorism in Yemen and the region as a whole," he said. "But we think this is the priority and the responsibility of our security forces and the army, and that what we need from the United States and other partners is, really, to build our capabilities, to provide us with the technical know-how, with the equipment, with the intelligence information and with the firepower." Daniel Benjamin, the U.S. State Department's point man for counterterrorism issues, told "Amanpour" that al Qaeda's following in Yemen has risen and fallen since its origins in the 1990s. "Dealing with terrorist groups is a little bit like trying to nail jelly to the wall," Benjamin said. "If they're not defending territory, then they will move around. What we have to ensure is that, wherever they move, those countries have the capability to deal with the threat." But Lang said the United States risks getting "suckered" if it gets more deeply involved in battling al Qaeda operatives in a deeply fractured country, he said. "I think it's a big mistake," he said. "We ought to play a minimalist role in these places." Yemen has long been able to get support from other world powers to equip its military. Both North and South Yemen received weapons from the former Soviet Union before their unification in 1990, and the United States has provided weapons through Saudi Arabia, Lang said. The current U.S. focus on the country is "just one more opportunity," he said. "Saleh and the Yemenis have been playing this game for a long, long time. They're far better at it than we are," Lang said. Fontaine said, "We're definitely involved with a very imperfect government there." But U.S. aid to Yemen, about $66 million in 2009, is a "rounding error" compared to the cost of the American wars in Iraq and Afghanistan. Enlisting U.S. allies to help reach a diplomatic resolution to the Houthi revolt in the northwest "would allow the central government to focus more of its resources and energy on al Qaeda," Fontaine said. But as Benjamin noted, Yemen's problems go beyond its civil strife. The oil reserves that provide up to 80 percent of its revenue are projected to run out by 2017, and its supply of fresh water is under pressure from a growing population and inefficient agricultural practices, Fontaine said. Fontaine said Yemen needs sweeping reform to improve government services, human rights and prisons, which have become a breeding ground for Islamic extremists. Anti-corruption watchdog Transparency International ranked Yemen as one of the world's most corrupt countries in 2009, though a 2008 report from World Bank found it had made "significant progress" in tackling the issue over several previous years. "There's been a problem of will and a problem of capacity," he said. "The problem of will has been not just a deficit of will to take on al Qaeda, but also to deal forthrightly with some of these basic problems they have in the country."